Well... I had some free time over the weekend, so I did this. The order of these pages/panels is probably all over the place...but it would seem we're having an Ayumu chapter next week. What do you guys think? Is Hata reviving S.S. Hamster? 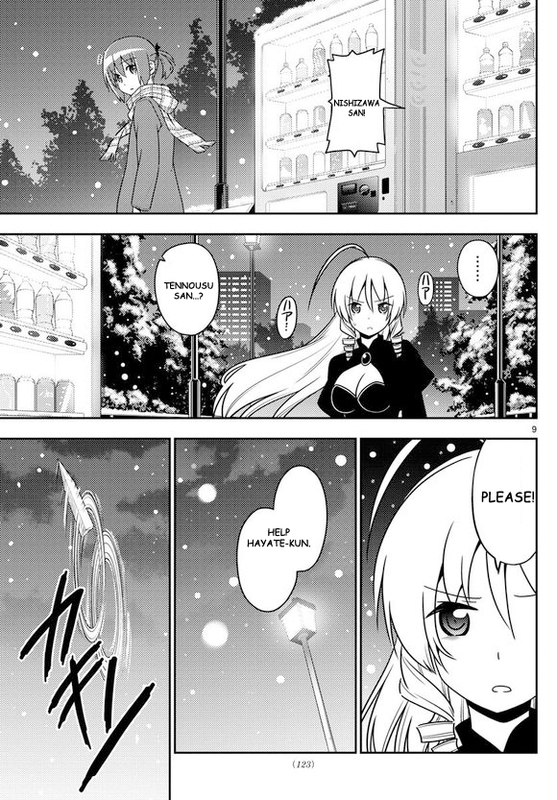 Is this just Hayate's dream? We'll find out in a few days... but wow, this is really something. 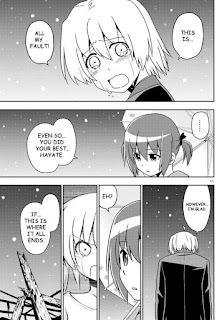 By the way, I just love watching Hayate's salty tears there. I was not expecting Hamster at this stage, but what is really confusing is how is she even here when she was the one girl explicitly going home for Christmas and not attending the party. 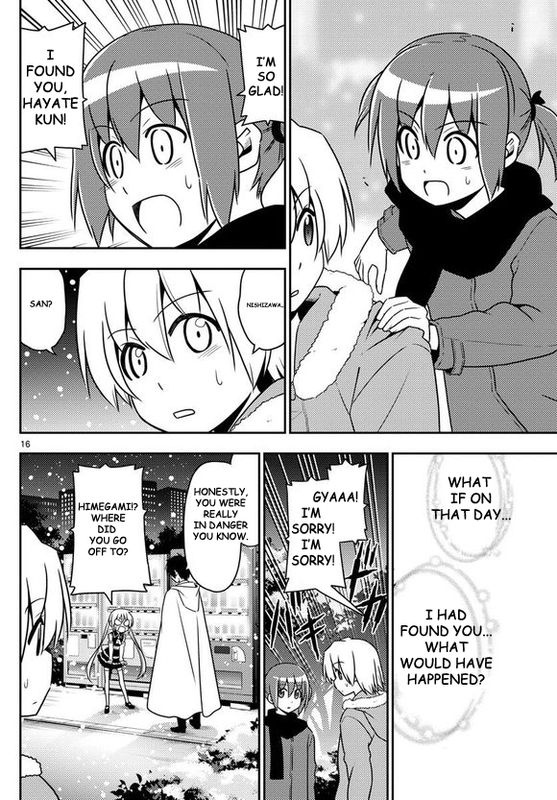 That said, Ayumu has always been an emotional center for most of the main characters, so if she helps Hayate sort through his feelings and find an answer that's a very appropriate spotlight role for her. I think he's sort of dreaming possibilities that the other person is also thinking of. Btw. 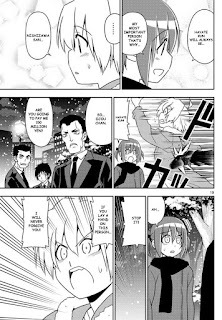 Why do you think Hayate almost deserves to die? Even kidnapping is life at most. Haha don't mind me. 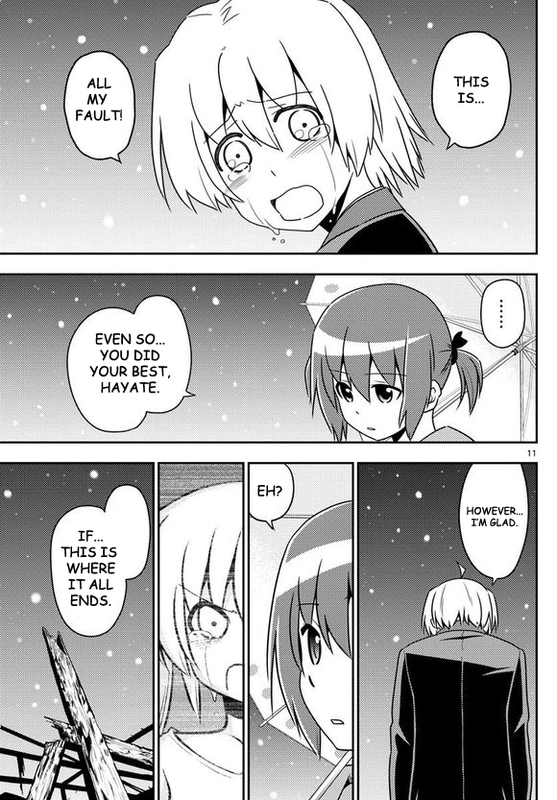 I'm not really serious about Hayate deserving to die. I just find it annoying that he's never ever thought of Nagi's feelings regarding the whole matter. He's trying his best to look out for what he thinks are her needs, but he's ignored or denied all the signs of her feelings for him until Chiharu revealed everything -- and even then, he did nothing about it while choosing to prioritize her inheritance. Now in all seriousness, I don't think he deserves to die for this, but rather, he needs to prove himself worthy of Nagi's love or he's better off just leaving her well enough alone. Yeah, I agree, Nagi's the best and Hayate does need to be more thoughtful (although I think he has proven himself to love her, just not romantically, so I think he deserves her care amd platonic love, but needs to earn the romantic love). I identify a lot with her struggles to achieve. Not usually I think the designated heroine is best girl. Perhaps that's Hinagiku, but I just like Nagi more. Also, my nick is Mellhurst. Don't kniw why my middle name is showing up. Ah, there, fixed. "Best girl" is pretty relative though. If we're talking about who has the "best interview question traits" it would be a toss-up between Hinagiku, Athena, and even Ruka. If we're talking about "best character" then that's pretty subjective, but in my personal opinion, Nagi does not lose out to any of her rivals. well if it in "smartess girl" category i think Nagi is the one, because she can skip 3 grades in a young age, she even beats Maria in roulette game, and she solve about the Loto (Sanzenin inheritance) Key whereabouts and she's a fast learner too about the Royal Garden stuff. It's pretty hard to compare Nagi with the other girls because based on "who is the most" she will lose out to everyone else in a lot of categories. Let's just say that for me, she is the most appealing and relatable -- and the girl I fell in love with. After realising that a certain debate went on for a month regarding a certain topic on certain post(s), I have no doubt that there will be a lot of disappointment among many people if hayate does end up with nagi, no matter how reasonably the author ends the manga. I loved the way yukiji helped hinagiku in chapter 563. And time and again, hinagiku proved to be such a good sister, not just as an younger sister to yukiji but as an older sister to Nagi as well. Heh... I'm not sure which topics/posts you mean, but sigh... haters gonna hate. As long as Nagi gets what she deserves, I don't care about other people's opinions. well from the start of the story is about the 2 of them meet because of fate, so i think Hayate should end up with Nagi. even the support character Hinagiku got into Main Character in HnG anime season 2 (well not to think bad of her but i guess it's a little wrong for me). I definitely love the way Nagi looks without her twin tails. More girlish and less kiddy. In any case, new chapter will be out in a few hours. We'll see what happens. I was wondering whether you would start reviewing another manga series after hayate no gotoku ends. I'm going to get serious withdrawal symptoms after the conclusion of this manga. I'll probably try to see if we Ad Astra piques my interest. 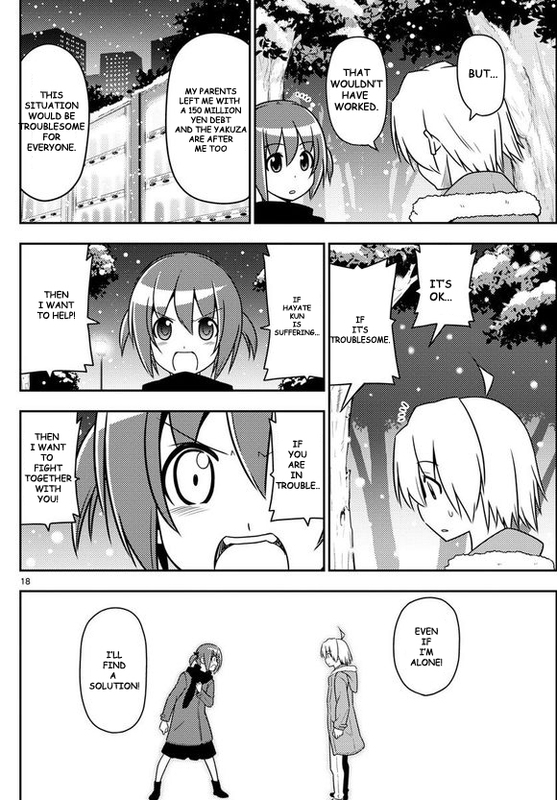 I'll never find another series that I'd have so much passion for than Hayate though (because of Nagi). I still plan to make Hayate related posts every week even after it ends. Even if it's just to post fanart, fanfics, or talk about something I never had the chance to while the series was ongoing.